So, each person share that one well loved recipe. Main dish, appetizer, casserole, veggie dish, bread, drink/punch, dessert, candy.....just share that favorite. What a wonderful idea!!! I love holiday cooking. This is something really tasty and easy!!! Mix above ingredients, chill and serve. Everyone loves this at Thanksgiving and Xmas, I never can make enough! Even people who hate coconut and nuts -- including my very picky kids, who loathe both! -- absolutely LOVE this easy to make recipe. I probably whip up five or more batches each holiday season! Preheat oven to 350 (325 if using a glass pan.) In a 13x9 inch baking pan, melt butter. Sprinkle graham cracker crumbs over butter. Pour condensed milk evenly over crumbs. 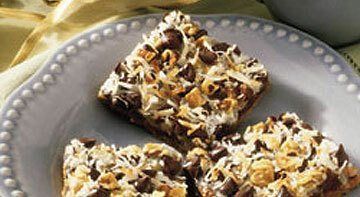 Top evenly with chocolate chips, coconut, and nuts. PRESS DOWN gently (I use a spatula). Bake 25 to 30 minutes or until lightly browned. Cool before cutting into bars.
. I make this every year for Thanksgiving dinner. Very yummy. Press into bottom and 2 inches up side of spring form pan. In a large bowl, combine cream cheese, flour and pumpkin pie spice until soft and creamy. Add canned pumpkin, then eggs one at a time, beating well after each addition. Gradually beat in sugar until it is all incorporated. Pour into prepared pan. Bake at 350 for 45 - 50 minutes or until center jiggles slightly when pan is gently shaken (center will set upon standing). Remove from oven and increase temperature to 450 for topping. In small bowl, stir together sour cream and sugar. Spread over top of cake. Return cake to oven for 5 minutes or until cream is set. Transfer to wire rack. Let cool completely before removing from pan. Refrigerate covered for 24 hours. What perfect timing. I am just planning a mini scrapbook/recipe book about my family's potluck dinners. We always get together on Christmas night and there are some recipes that are ALWAYS there, no matter what. I thought it would be kind of cool to journal them for the next generation. My extended family all have Christmas tea (dinner) together and as we celebrate Christmas in the middle of summer, it's usually cold meat/barbecue and salads and desserts. For my whole life the dessert has always included my aunt's meringues, fruit salad, spanish cream and christmas snow. It's now my task to make the Christmas snow. It's a completely hideous, heart-attack inducing throwback to the 60s - but it just wouldn't be christmas without it. I can only justify eating it, by the fact that we only have it once a year! In honour of my sister (who the last few years has been in the UK at christmas) I hide a little container in the back of the fridge and have it for breakfast on Boxing Day - something she taught me way back when - it tastes soooo much better that way! One can crushed pineapple (I think 400g). Dump pineapple into a bowl - chop cherries and ginger finely and soak in pineapple mixture. Using kitchen scissors dipped in icing sugar chop marshmallows into halfs or thirds depending on their size. Whip cream to just past the soft peak stage. Fold in the fruit and marshmallows. Chilll in fridge for a couple of hours to allow the ginger flavour to permeate the whipped cream. Perfect with fruit salad to offset the disgusting creaminess of the pudding! I'll leave the cooking up to you all. If I spend time in the Kitchen it is to dye fabric. Most of the time it is frozen dinners for me. Since we have so many Chocolate Lovers out here...and with Halloween just around the corner with possible parties this upcoming weekend.......I thought I'd add one more recipe to this thread. This is the easiest Fudge to make, with the best outcome consistently. I worked with a girl who was a choc-o-holic and she loved this fudge. You can play around with the "nut" part too. Leave them out or add another kind. One year I added mini marshmallows and made a rocky road fudge. I usually leave the nuts out..and go for plain. 3) Remove from heat and add the nuts, chocolate chips, and liqueur if using. Stir until the chocolate has completely melted. 5) When the fudge is set, cut into 1 inch squares. Store in an airtight container, separating layers with wax paper. I hope you can read this (if not let me know). I made this last night and brought it to a dinner party. It's one of my all-time favorites. Very yummy and great for the holidays. This is a page from a cook book I made for my daughters. Once they moved out of the house, they were always calling and asking for some recipe or the other that I made while they were growing up. So, I compiled a little cook book for them for their birthdays (both in July). There are about 40 recipes. 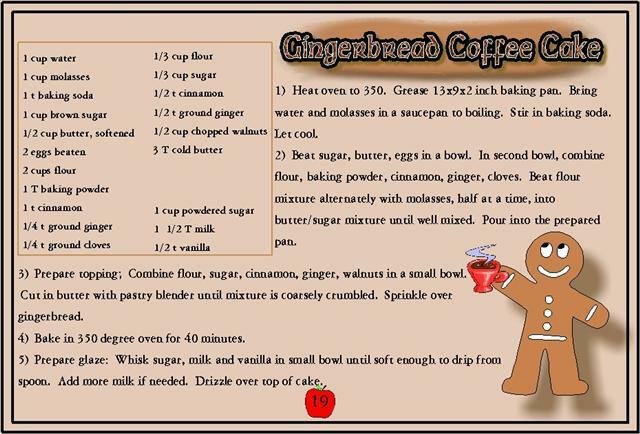 I made each recipe card on Print Shop by Broderbund then had it laminated and bound for them. I've since had to put two more together for my daughter's girlfriends. Mix three ingredients together and pour over beef brisket. Put in heavy pot with cover. Cook slowly for 3-4 hours or until it shreds with knife and fork. Place shredded pieces back in sauce. With electric mixer -beat cream cheese and 2 cups of powdered sugar together until smooth. Spread mixture on bottom of piecrust. With electric mixer, beat milk and instant pudding together for 2-3 minutes (until it thickens). Slice fresh banana on top of the cream cheese layer. Pour pudding on top of bananas. beat the cream with enough powdered sugar to taste until it is whipped cream. I use about four tablespoons. Spread on top of pie. Put in refrigerator for about ½ before eating. You could slice fresh bananas on top of sliced pie just before serving. Penny, I'm definately fixing your recipe tonight. However, I'll substitute red wine and Nacho flavored Doritos. I hope that will be OK.
Aww PenPen, can I join ya??!! There are some great recipes here...I especially like the Gingerbread Coffee Cake...umm, gingerbread and coffe...ummmmm......gonna have to make that now! I love your recipe, PenPen! I like seeing different recipes. We might have to try some.